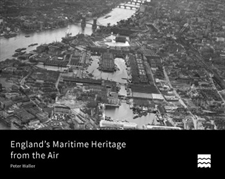 In his new book England’s Maritime Heritage from the Air Peter Waller presents a stunning array of images of our coastal heritage from the Historic England archives. In celebration of the book’s launch, Joe Flatman, Head of Listing Programmes, tells us about 10 coastal sites in England which are open to the public, and are worth a visit at any time of the year. Tell us about your favourite coastal heritage sites in the comments. 1. Lindisfarne Castle, Northumberland, Grade I listed. Originally a 16th century castle, Lindisfarne was converted in 1902 into a luxury family home by the architect Sir Edwin Lutyens for Edward Hudson, the founder of Country Life magazine. The castle affords fine views of the nearby coastline and walks around Lindisfarne Island, including the site of the nearby Anglo-Saxon priory. The island is only accessible via a causeway that floods at high tide, so do remember to check the tide times before visiting. 2. Whitby Abbey, North Yorkshire, Scheduled Monument. The famous cliff-top abbey was founded in the 7th century and redeveloped in the 11th century. Its atmospheric ruins were the inspiration for Bram Stoker’s 1897 gothic tale of ‘Dracula’ and have been a draw to tourists since that time. A climb up 199 steep steps offers wonderful views across Whitby and out to sea. 3. Spurn Point, East Yorkshire. A three-mile long sand spit reaching out from the mouth of the Humber Estuary into the North Sea, enabling close-up views of shipping heading into and out of the estuary. The area is best known for its nature reserve, an important feeding ground for a wide variety of wading birds and migratory species. However, Spurn Point also includes a Grade II listed lighthouse of 1893-95. 4. Orford Ness, Suffolk, scheduled monument with a series of associated listed structures. This large nature reserve was once a top-secret military testing establishment, and is home to an extraordinary range of 20th century military structures. Cold War nuclear-weapon testing facilities are abandoned amid an eerie shingle landscape, accessed only by ferry boat from Orford Village. 5. Reculver Towers, North Kent coast, Scheduled Monument. Originally a Roman coastal fort, the site later became an Anglo-Saxon monastery before becoming the parish church for Reculver. The towers that form a distinctive feature on the local skyline were built in a remodelling of the church in the 12th century. Fine walks can be enjoyed along the adjacent coastline, affording goods views of shipping entering and leaving the Thames Estuary. 6. Dover Castle, Kent, Grade I listed. One of the most famous landmarks in England, this site has an extraordinary history stretching back to the Roman era, and has been a centre of defence against attack from mainland Europe since the Middle Ages right up until the end of the Second World War. It provides stunning views across the Straits of Dover to the coast of France. 7. The Needles Batteries, Isle of Wight, Scheduled Monument. Originally a 19th century coastal fort, the site was used extensively by the military in both the First and Second World Wars, before being redeveloped as a rocket testing site in the 1950s; it is said to have been one of the inspirations for the 1955 James Bond novel ‘Moonraker’. 8. Calshot Castle, Hampshire, Grade II listed. Begun as a coastal fort in 1539, the site was redeveloped during the First World War as a seaplane base, a role it also served during the Second World War. Nearby is a Grade II* listed former aircraft hangar – now a sports centre with a cycling velodrome, dry ski slope and climbing wall. 9. Dartmouth Castle, Devon, Grade I listed. Set in gardens in one of the most beautiful coastal settings in England, this medieval (and later) castle was used in a military capacity right up to the end of the Second World War. Originally begun in 1388, it guards the narrow entrance to the Dart Estuary and the busy, vibrant port of Dartmouth. 10. Brean Down, Somerset, Scheduled Monument. The site has been in constant use since prehistory, with evidence for activity back to at least 10,000 BC. The most significant features are the Iron Age promontory fort and later ruins of the Victorian fort of 1864-71. Standing 97m high and extending 2km into the Bristol Channel, the site affords views across the Bristol Channel to South Wales in good weather. Remember to check opening hours before visiting, and always take care at the coast, especially families with young children. Have you visited any of these dramatic coastal sites? Each of our 10 picks are linked to their list entry pages. Have a look and take part in the Enriching the List project – you can add your knowledge and images to The List, capturing your experiences and bringing these special places to life for future generations. Find out more about Enriching the List. The picture of Lindesfarne Castle is actually a picture of thr ruins of Lindesfarne Abbey! I live quite(ish) near the Needles & never knew the battery’s were there! Shame on me.